The Senior Associate of High Court Team is a senior person, have experiences in dealing in High Court, District Court matters. The person plays a central role in hearing and drafting most pleadings of High Court matters and also provides significant input in preparing case theory for litigation involving white collar crime, judicial review and commercial matters both lower and higher courts. His/her knowledge of law & practical experience allow the firm to take quick decisions in preparing case theory. As a senior member he oversees the activities of junior member of his/her team. Mr. Tanzeer Ahmed is the Senior Associate of High Court Team. Mr. Ahmed achieved best employee Award for the Year 2018. 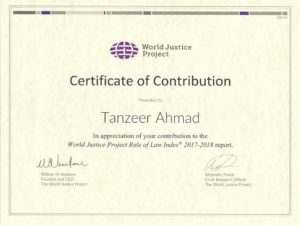 Mr. Ahmad was awarded a Certificate of Contribution to the ‘World Justice Project Rule of Law Index 2017-2018 report’. Mr. Ahmad successfully completed LLB (Hon’s) and LLM from the reputed university of Bangladesh. Before joining the firm in 2017, Mr. Ahmad worked with a reputed law firm. He has a right of audience before Hon’ble High Court Division, District Court and most Tribunals of Bangladesh. He is the registered member of Bangladesh Bar Council, Supreme Court Bar Association, Dhaka Taxes Bar Association, Dhaka Bar Association and Labour Court Bar Association. Mr. Ahmed is presently acting as the Head of Commercial Department and also a senior member of Dispute Resolution Department. Mr. Ahmed has significant experience of dealing with most white collar crime related drafting and hearing before higher and lower judiciary. Besides, he has been involved for the firm in drafting and case preparation of a number of commercial and admiralty litigation. Before joining the firm was the law officer of Ha-meem Group, where he handled a number of labour disputes and cases pending before labour court. Successfully challenged a proceeding under Foods Safety Act 2013 brought before special magistrate court by filing quashment proceedings before Hon‟ble High Court Division against KB Foods Ltd of Khan Bahadur Group. Successfully challenged the order of RAJUK for eviction of SBARRO from building located in Banani & Gulshan area. Hearing of Labour case successfully for Rashawa Industries Ltd.
2012 – LL.M from Bangladesh University. 2010 – LL.B (Hon’s) from Stamford University Bangladesh. 2015 – Enrolled in the High Court Division of the Supreme Court of Bangladesh. 2012 – Enrolled in the District Court & Tribunals. Achieved Best Individual Performer Certificate-March 2017. Achieved Best Individual Performer Certificate- October 2017.